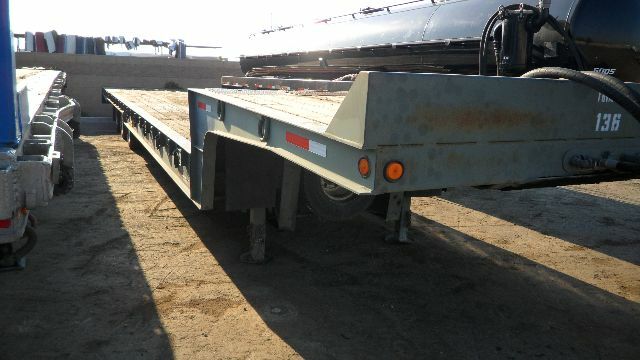 2000 TRAIL KING TK110SA - Drop Deck Trailer in Chino Hills, California - Listing# 503871 - FMC Shipping LLC. Please contact me regarding the 2000 TRAIL KING TK110SA - Listing# 503871 for sale at TruckerToTrucker.com. Take a look at this 2000 TRAIL KING TK110SA. It is Listing# 503871 at TruckerToTrucker.com. TK110SA Sliding Axle Tilt Model; Fixed Neck; Apitong Floor; Sliding Tri Axle; Steel Composition; Hydraulic Tail - 110,000 lb capacity overall, 70,000 lbs in 16 feet. 53', winches, D-rings, Outriggers 120" width. Hydraulic functions work off tractor wet kit , Aluminum wheels, power winch. great condition , ready for work!